▪ The customer's credit cards are encrypted using the key you configure in this window from when the customer enters their card details. 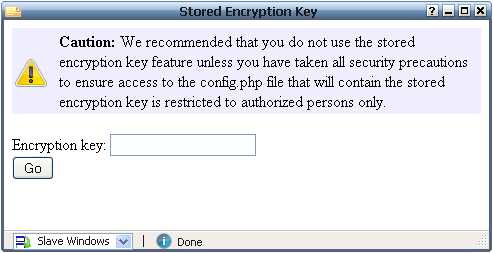 You will not have to regularly convert the encryption type of the card details from Inter Key to a Custom Key. ▪ You can enable a scheduled task that will charge the cards once a day automatically without requiring you to manually login and do a credit card capture. 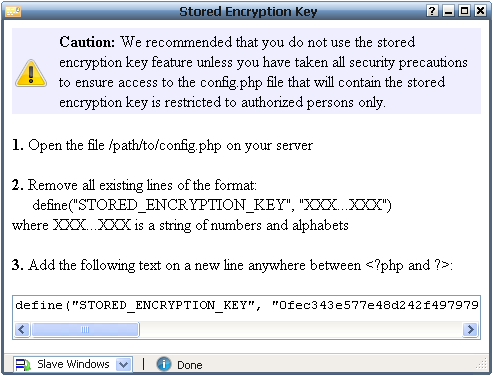 We recommended that you do not use the stored encryption key feature unless you have taken all security precautions to ensure access to the config.php file that will contain the stored encryption key is restricted to authorized persons only. If you would like to charge credit cards automatically once a day without manual intervention, you will need to enable the credit card capture task. Open the Task Scheduler window (under the Setup menu) and locate the task with the description "Charge credit cards of customers with pending invoices". Change the status for this task to Enabled and save the changes. You can also change the time at which the task runs in that window. The Credit Card Configuration window contains an option named "Credit card capture when invoice due in (days)" which controls which invoices get charged each day. Configure the number of days before the due date of an invoice the customer's credit card should be charged.